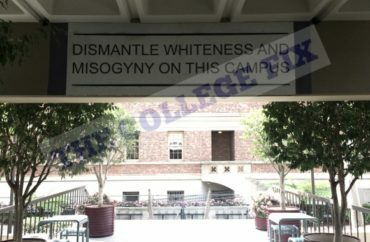 An artistic mural has been installed at the University of Southern California that declares “dismantle whiteness” in big, black and white capital letters, one part of a larger display designed to spark conversations regarding “racism, sexism and xenophobia,” according to its creators. 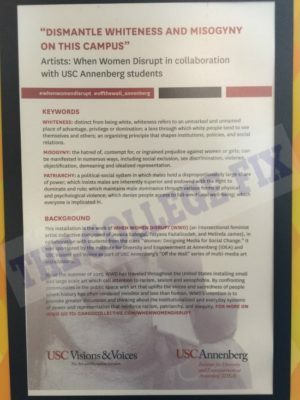 Recently installed at an entrance to the Annenberg School for Communication and Journalism building, it depicts large sketch drawings of four women of color on walls flanking the doorway with the words “DISMANTLE WHITENESS AND MISOGYNY ON THIS CAMPUS” posted on the ceiling above it. “In fact, the text was derived from conversations with students about race, gender and class issues on campus. There have already been many generative conversations prompted by the work—by those who align with the sentiments and those who do not,” she said. An informational flyer near the display further explains the exhibit. “Since the summer of 2017, WWD has traveled all throughout the United States installing small and large scale art which call attention to racism, sexism and xenophobia. By confronting communities in the public space with art that uplifts the voices and sacredness of people whom history has often rendered invisible and less than human, WWD’s intention is to provoke greater discussion and thinking about the institutionalized and everyday systems of power and representation that reinforce racism, patriarchy, and inequality,” it states. According to an article in The Daily Trojan, several students were not satisfied with the location of the artpiece, as they believe it should have been placed in a more highly traversed area. USC student Claire Porter blamed the administration. “It’s placed in a very hidden area of campus where it’s not usually seen and I think that speaks to the administration and how they want to frame and direct the conversation and the impact — the fact that it is inward-facing not outward facing — all of these factors are intentional from the administration and I think this project would have been much more powerful if the artists were given more freedom,” Porter said. Trope also told The Daily Trojan that she was disappointed after the mural was denied by the administration to be placed on Watt Way, a more public area. 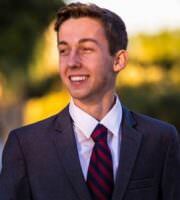 “It’s disappointing to me because I think it could have had a great impact on our community in terms of spurring dialogue and conversation about race and gender and campus climate,” Trope said.